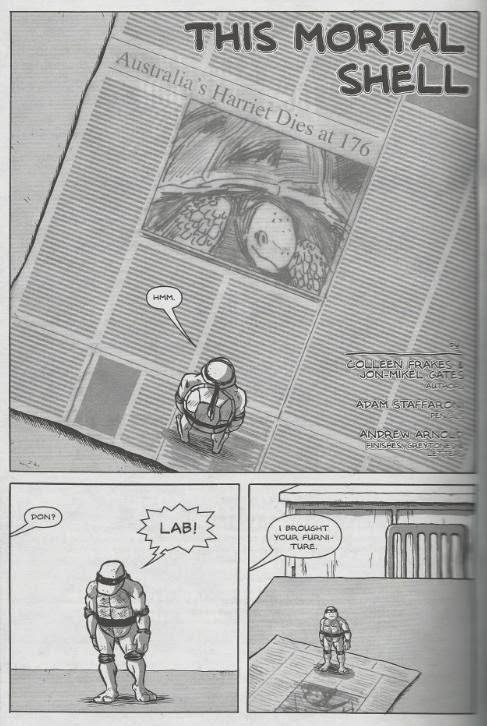 In his lab, the shrunken Donatello is reading a news article about Harriet, a tortoise from an Australian zoo who had just died at the age of 176. April enters the lab with doll house furniture for Don to use as well as a fresh pot of tea for them to share. Over the tea, Don reflects on the concept of mortality and ponders how long he and his brothers might live, especially since he was mutated from a red-eared slider, a turtle with an average lifespan of only 35 years. Meanwhile, the hulking and monstrous “Gameraph” lurks the alleys of New York, stumbling across several robbers. As Raph brutalizes the robbers, Don and April discuss the recently deceased Master Splinter. Don doesn’t feel that he and his brothers have been coping with the loss of their father well at all; Leo has retreated into his ninjutsu studies, Mike has been spending all his time at his new tour guide job and Raph has been succumbing to his anger worse than ever. Speaking of Raph; one of the robbers attempts to shoot him. The Turtle escapes the bullet with a mere graze, but the pain pushes him over the edge. Raph grabs the thug by his head and begins slamming him into the concrete over and over again. Don asks April how she’s been holding up, considering the various personal tragedies she’s so recently endured, and with Casey and Shadow to take care of, he asks if she’s had any time to even reflect on her grief. April looks away, clearly not having been able to do so. Don consoles her, explaining that family can be a great comfort, though he wonders if they’re all enough for each other. Back in the alley, Raph observes the fleeing thugs and the twitching, barely alive gunman on the ground. Repulsed with himself, the monstrous Raph slinks away into the darkness. As April cradles the itty-bitty Don in her hands, she tells him that the important thing is whether they’re each enough for themselves. *This story is specifically declared as “non-canon” in the opening editorial letter. *Were it canon, however, it would take place between TMNT (Vol. 4) #22 and TMNT (Vol. 4) #23. *Don was shrunken down in TMNT (Vol. 4) #15 and discovered he couldn’t be enlarged in TMNT (Vol. 4) #21. *Raph was bitten by vampires in TMNT (Vol. 4) #12 and mutated into “Gameraph” in TMNT (Vol. 4) #15. *Mike’s job as an alien tour guide got him taken prisoner in outer space in TMNT (Vol. 4) #20. *Leo began investigating the suspicious secrets of Karai and the Foot Clan in TMNT (Vol. 4) #18. *April nearly died from Baxter Stockman’s nanobots in TMNT (Vol. 4) #9 and learned of her inhuman origin in TMNT (Vol. 4) #14 (an origin not told until TMNT (Vol. 4) #22). *Splinter died in TMNT (Vol. 4) #10 and had his funeral held in TMNT (Vol. 4) #11. *This story was the product of students at the Center for Cartoon Studies. 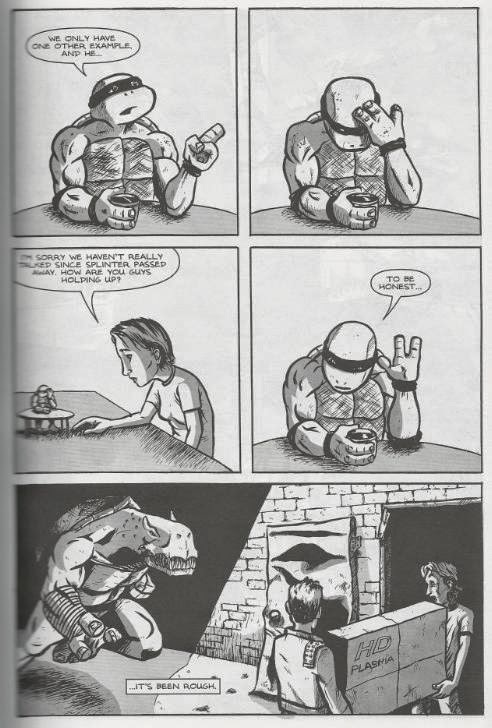 This here is a nice little “stop and reflect” story that the heavily serialized pace of TMNT Vol. 4 could have really benefitted from. The pacing of this volume made it almost like a soap opera or newspaper comic, where every issue leads directly into the next and you’re hardly afforded the opportunity to stop and take it all in. A light story where two of the characters simply sit down, talk about all the crazy stuff that’s going on in their lives and ask if each other is doing okay really goes a long way in giving the characters a break and the audience as well. Unfortunately, Laird seemed keen on declaring this one “non canon”, to the point of having that made expressly clear in the opening editorial of the issue, so I guess he didn’t feel the same way. Bummer. Exactly what harm Laird felt this story perpetrated that it should be stricken from the record at the moment of publication vexes me. Not only does the nature of the story offer a breather to the characters and the audience, but it also complements a plot point from the next issue. Here, Don tells April she needs to take some time for herself to reflect on her personal tragedies. In the following issue of Volume 4, April decides to go on a solo journey to “find herself”. Just that one little sentence from Don does wonders toward making her decision feel smoother and more natural, particularly considering her erratic behavior in the previous issue of Volume 4 (where she becomes the new Nobody for ten minutes). The story-itself focuses primarily on Don, April and Raph’s various issues, but makes reference to Mike and Leo who have separated from the featured cast by that point in Volume 4 (Leo by studying about the Battle Nexus in private and Mike by getting hauled off to space-jail). The creators at CCS prove they’ve done their research, referencing the necessary stories and ensuring their tale fits in perfectly between issues of Volume 4. As a matter of fact, the Turtle robot Don is working on can be seen half-built and covered in a shroud in the background, just as it’ll appear in the next issue of Volume 4! The art by Adam Staffaroni is a bit crude, at least in regards to April and the muggers. He seems to have an easier time drawing Don and Gameraph. The Don segments also suffer from an excess of empty white space, though the Raph segments come out ahead with lots of moody night time atmosphere. Raph’s sudden disgust over what he did at the bottom of page 17 is a real highlight, as he reaches out to the critically injured mugger while holding his face in shame. It really speaks volumes without saying a word. “This Mortal Shell” is pretty much an all-dialogue story, so you have to be into that sort of thing, but the dialogue feels very natural and relevant to the ongoing narrative of Volume 4 (meanwhile, the actual dialogue within Volume 4 is very awkward, clunky and absurd, making this story all the more welcome). If you take editorial mandates of what does and doesn’t count seriously, then you’ll be doing yourself a disservice by skipping this short in your Volume 4 read through. If you’re more willing to decide for yourself on what should and shouldn’t be considered “canon”, then “This Mortal Shell” really does enhance the reading experience and overall journey for at least three of the characters. Maybe Laird was jealous because this actually was a good story, and declared it non canon out of spite. So, basically, we have to ignore the really good non-canon story with good dialogue vs. having to accept the not-always-so-good actual ongoing canon with bad dialogue? Okay, then, Mirage. I'm assuming from the review text that Laird didn't give an actual reason why this story is non-canon, but just said so? Unless, probably because it was done by some other entity not connected to Mirage, and the only way it could be published is to make sure "it doesn't count"? I'll still take that vs. not being published at all. Well, I'm not sure if this would have had anything to do with it, but I can sort of see some details that would break canon. For one thing, Donatello describes the turtles as crime fighters, but the Mirage turtles never made crime fighting a habit, as it certainly would have increased exposure risk, and even after Utrom first contact it might have attracted unwanted attention to their still-secret lair. Another thing is the implication that, besides the turtles, the only other mutant was Splinter. 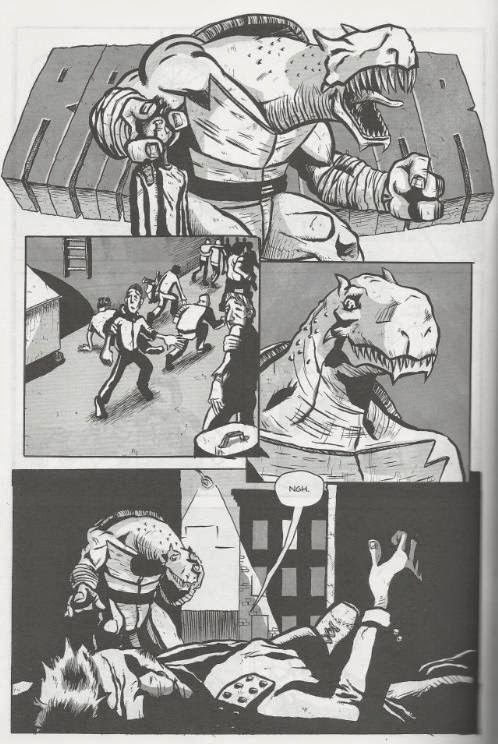 But the writers completely forget about Leatherhead who has been known to be a mutant since volume 1. Not that these would necessarily automatically disqualify the story, but it may also depend on who was writing/editing it. There are plenty of canonical Mirage TMNT stories with significant plot holes; though, in fairness, most of those stories' writing credits go to Murphy/Clarrain.